Reality Check: The many ways Magneto has mastered magnetism – AiPT! Wait, so there IS a way for him to levitate people? Since their debut in 1963, the X-Men have sworn to protect a world that hates and fears them, but here at AiPT! we’ve got nothing but love for Marvel’s mighty mutants! To celebrate the long-awaited return of Uncanny X-Men, AiPT! brings you UNCANNY X-MONTH: 30 days of original X-Men content. Hope you survive the experience… AiPT! Science is going all-in for Uncanny X-Month, and following the most detailed look at X-Men biology anywhere, EVER, we’re on to, well, everything else! Astrophysicist JD Voyek of Bad Background Science (and the most recent AiPT! Podcast) is here to tell us why Magneto’s ability to manipulate things we don’t normally think of as magnetic might ACTUALLY make sense. I say this as a woman who, when she was a child in the early ’90s, used to run around the house in a teal sweatsuit and yellow socks on both her hands and feet, pretending to be Rogue — I don’t like the early X-Men comics. Professor X is a dictatorial butthead who lies to his students. The creators tried (and failed) to repeat the relationship of Johnny Storm and Ben Grimm with Bobby Drake and Hank McCoy, and the boys regularly sexually harass their only female teammate. But they did get one thing right, though obviously it took a while to flesh out his backstory and motivations: Magneto. 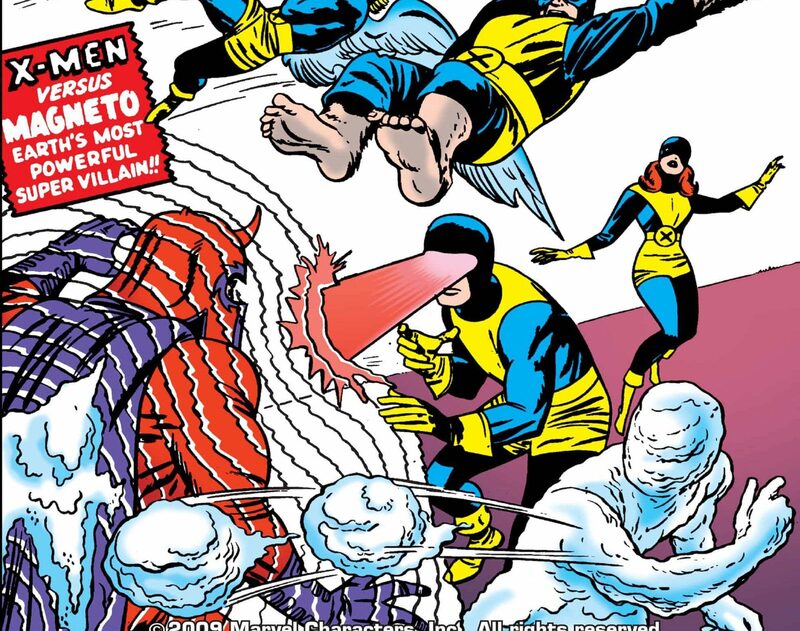 The first appearance of Magneto reveals his secondary superpower: illuminated eyeballs. (Marvel Comics) Fun fact: some people still think we see because light shoots out of our eyes, rather than bouncing into it. It’s one thing for this Homo superior specimen to hurl Wolverine across the room – but regular Joes? Humans aren’t magnetic, are they? Most of the atoms we interact with have negatively-charged electrons buzzing around in fuzzy yet defined orbitals. Sometimes those electrons are involved in bonds, sometimes they’ve been donated into a communal sea and can easily move from one atom to another (this is what makes metals conductive), and sometimes they’re just doin’ their own thing. But they’re all negatively charged, and do you know what happens when charge moves? You get a magnetic field (thank you, Relativity). Each electron acts like a teeny, tiny magnet. Normally the electrons are moving in completely random directions, so the teeny, tiny magnetic fields are pointing in all different ways, and their fields cancel each other out. But the fact that all those tiny magnets are there means – in the presence of another magnetic field – we can manipulate where they’re pointing and get them all going in the same direction. Compounds we call “non-magnetic” actually come in two flavors: diamagnetic and paramagnetic. They’re not really non-magnetic, though. The effects show up when the stuff is placed inside an external magnetic field, and disappear when that field is turned off. In diamagnetic materials, the electrons reorient themselves so their magnetic fields are pointing the opposite direction, creating repulsion. So, contrary to the speech bubble above, Magneto doesn’t need to switch his magnetic field from negative to positive to repel the inferior humans. Diamagnetic materials are always repulsed by a magnetic field, no matter the polarity. Ferromagnetism is what we traditionally think of as plain ‘ol magnetism. Unlike paramagnetic materials, ferromagnetic ones get to take advantage of an additional quirk of quantum mechanics. A group of atoms anywhere from 0.1 mm to a few millimeters in size – which is huge on an atomic scale – will basically walk in lockstep, acting as one “domain.” Many domains make a lump of ferromagnetic material. When domains are randomly oriented, the lump of iron or cobalt or whatever you have isn’t magnetized. But an external magnetic field will cause each of the domains to point in one direction, parallel to that external field. That produces a much stronger magnet than you’d get from paramagnetism. Ferromagnetic materials are also capable of maintaining a permanent magnet field on their own, though high enough temperatures or whacking it with a hammer will cause many of the domains to randomize their orientations. As the master of magnetism, Magneto should understand these principles and be able to take advantage of all three, though it probably took a little bit of time to finesse. Especially when it comes to levitating diamagnetic materials, like boulders. Under normal circumstance, diamagnetism is imperceptible. But at extremely low temperatures and/or under a very strong external magnetic field, traditionally “nonmagnetic” objects can be noticeably levitated. Including frogs. So it makes perfect sense that Magneto can levitate people, and dust, and any of the other stuff he’s lifted over the years. Regular humans can do it, too, but it’s much less impressive. Now, how his mastery of magnetism allows him to astral project his consciousness? That I can’t answer. Hey! Superman’s the only character who’s allowed to add random powers for plot purposes!